The following is a note from a patient about their experience with blepharoplasty, or an eyelid lift. 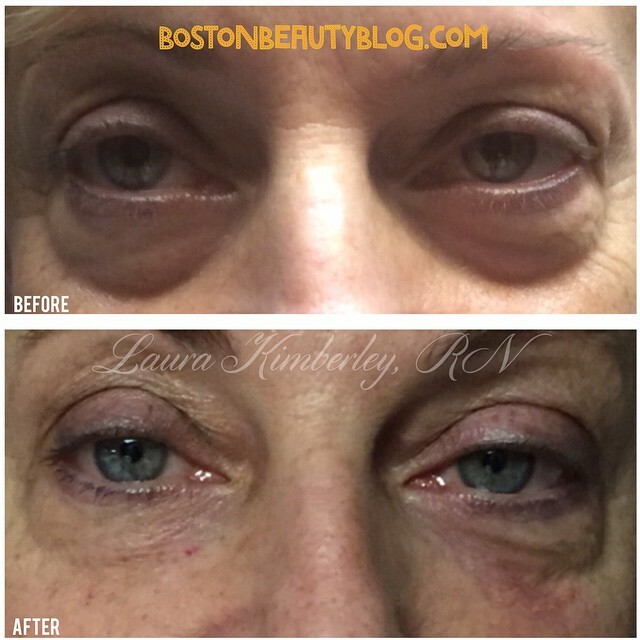 The patient has been a client and friend of mine for years, and had started doing Botox to lift her eyelids, although ultimately, she wanted surgery. I encouraged my client to talk to a plastic surgeon, just to get an idea of what the surgery was like, and when would be the best time for her to undergo this procedure. The patient decided to book surgery after her consultation. I was able to assist in the procedure at the Newton Surgical Center location. Because the patient was also a friend of mine, we had previously arranged for me to take care of her post-op as well. The surgery itself was only about 2 hours start to finish. The patient stayed home for the next few days, but had very little pain or swelling. The best advice we can give: keep frozen peas in plastic baggies in the freezer and switch them out every 20-30 minutes. Ice decreases swelling, and the peas are light weight and mold to the shape of the eye. I knew there was some use for those things (I am not a fan of peas!). I would like to thank this client for sharing her story! In severe cases, where vision is compromised, everyday tasks (such as driving) can be hazardous. An eyelid lift gives the patient a more awake, alert and youthful appearance and increases the field of vision. Whether one is looking to treat their upper lid, lower lid, or both, this procedure is generally the same. Blepharoplasty is usually performed under local anesthesia in an office or hospital setting. I’ve assisted in many bleph’s (Observing Surgery: Blepharoplasty). A crescent shaped incision is made either in the upper eyelid fold or next to the lash line on the lower lid. Excess skin and fat are removed and small, inconspicuous sutures are left behind. After surgery is complete the eye area can bruise and swell. Cold compresses (or peas!) can be applied gently to minimize these effects. Antibiotic ointment also needs to be applied for the first couple of days to prevent infection. Patients will return to for a follow up a week after surgery monitor the healing progress and most return to work soon after that. The incision lines will fade after approximately two months, but are barely visible. my eyebrows in hopes that it would raise my eyelids. It became just so natural for me to do that – hence – wrinkles. Can’t win!! Then I met Laura. Here I am – Miss Deathly Scared of Needles – and I had no qualms about getting shot up with Botox. Instantly there was an amazing difference. She was able to raise my brows so that it took an edge off of my drooping. As a couple of years went by, I just got to the point where it just wasn’t enough for me. Hey, I am approaching 60, how long am I going to wait to become 40 again. Laura talked to me about seeing a doctor to get my eyes done. He was running a special time of the year sale and who doesn’t like a sale?? But seriously, I made the appointment and met the Dr. I felt so comfortable with his approach and what he had to say. Originally, I had only wanted to get my top lids done. I had been so focused on them for so long that I didn’t even think about underneath the eyes. The doctor explained the full procedure to me (both top and bottom) and recommended I do both lids. He showed me the excess skin I had, and suggested once I did the tops, I would definitely want to do the bottoms (they were pretty saggy as well!). He said it didn’t make sense to do surgery twice. I was very happy with what he told me and made the appointment. I was more excited than I was nervous on the day of my surgery AND lucky. I had my own private nurse. Laura picked me up and brought me in for the surgery. She actually stayed and watched the surgery for more of that unstoppable knowledge that she craves. I wasn’t totally knocked out, so I have very faint bits of hearing some things. Apparently, I wanted to get up and help. How thoughtful of me!! When I was done, Laura took me home and took care of me (as much as I can remember). Thank goodness for peas, the best home remedy in the world. My recovery was so fast. I didn’t have any problems at all. It was amazing. I chose to stay in the house for almost a week just because I am so vain and it forced me to stay home and work. From being so healthy and constant peas on my eyes, my lids started healing over the stitches so they took them out early. Four of my friends came over to see me one day to bring lunch. I think I was in the very purple stage. No one wanted to say anything. My cousin told me later that she was scared to death looking at me. I knew how bad I looked. Now they all can’t believe how amazing my eyes look. I absolutely love them. AND the funny thing is that with all the focus on the lids, the best thing I did was underneath the eye. I would do it all over again in a heartbeat. Why I Chose to Have a Tummy Tuck.